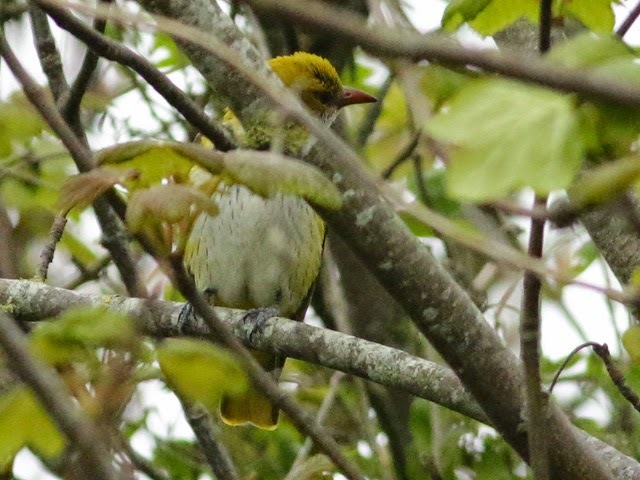 Overnight wind and rain knocked down another small arrival around the island, although with sporadic dizzly rain persisting throughout the morning birding certainly wasn't easy going. 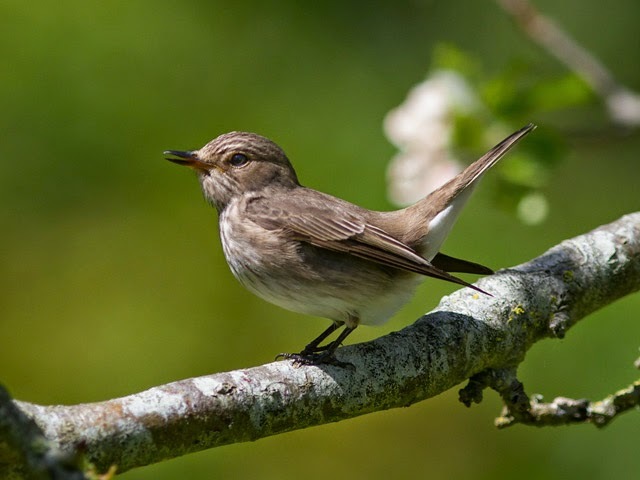 The Bill area got the best of the coverage and came up with 11 Spotted Flycatchers, several 'extra' Whitethroats, 2 each of Reed Warbler and Chiffchaff and a single Sedge Warbler on the ground; a few small flocks of Swifts overhead looked more likely to be locals struggling with the weather rather than fresh migrants. Another couple of Spotted Flycatchers were at Southwell, whilst a flurry of waders at Ferrybridge included 35 Sanderling and 12 Dunlin. 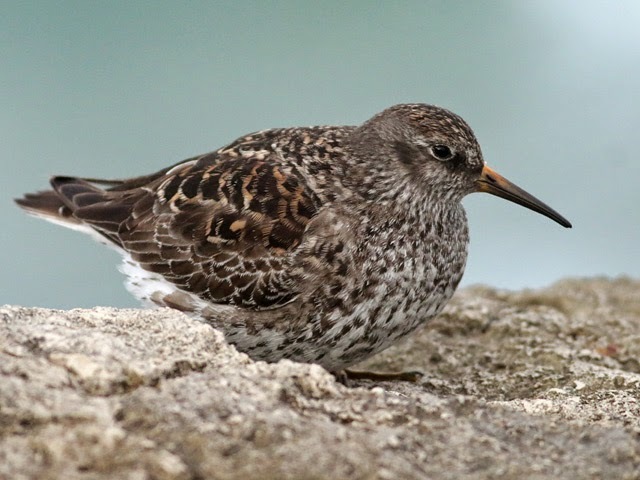 The fresh wind did precious little for the sea: 46 Common Scoter passing through off the Bill was a notable count of a species that's hitherto been severely under-represented this spring, but a few passing Manx Shearwaters were the only other worthwhile sightings. Another single Bordered Straw at the Obs was the best of the overnight immigrant moths. 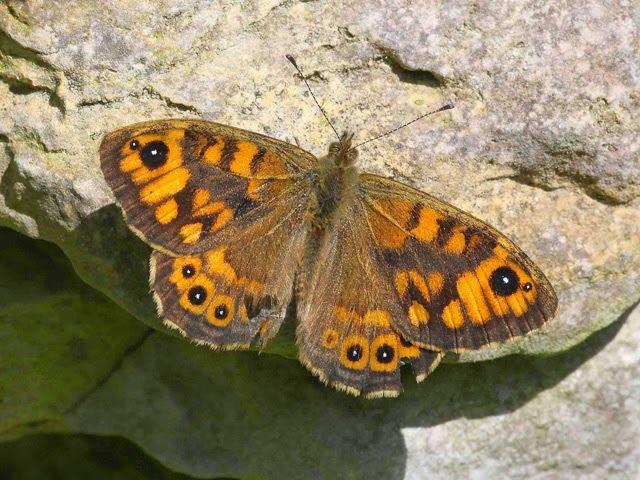 Although there are still a few tardy common migrants trickling through it's worth drawing attention to just how dreadful May has been for overall numbers. Today's very small arrival took the Obs garden month ringing total to 230, which compares mightily unfavourably with an average May total during the last four years of 736. 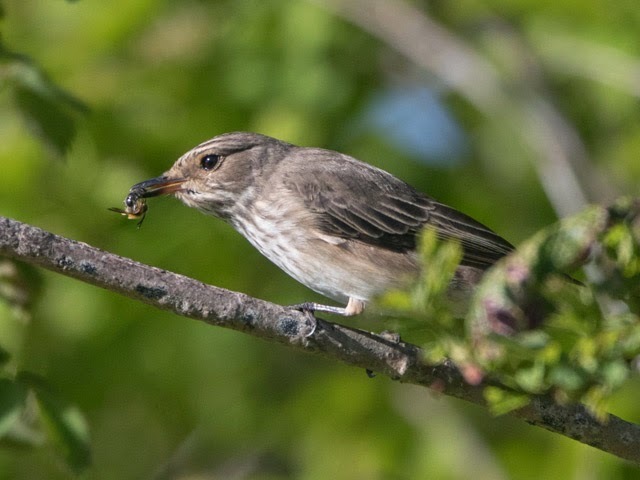 One or two species have done OK - in taking the top two places Chiffchaff and Spotted Flycatcher (54 and 32 respectively) fared well - but only four others managed a double figure total, with Willow Warbler and Whitethroat (on 27 and 18 respectively) doing conspicuously badly amongst many totals that make grim reading. Let's hope that these events reflect the vagaries of the weather rather than some sort of profound downturn in the fortunes of our summer visitors. 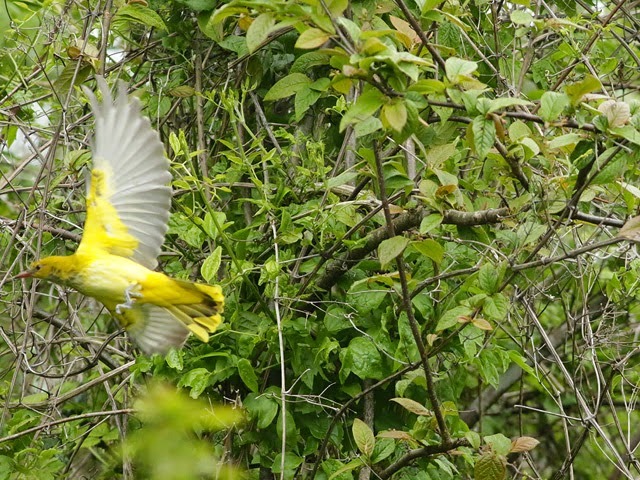 Just a handful more late migrants to show from today's fieldwork. 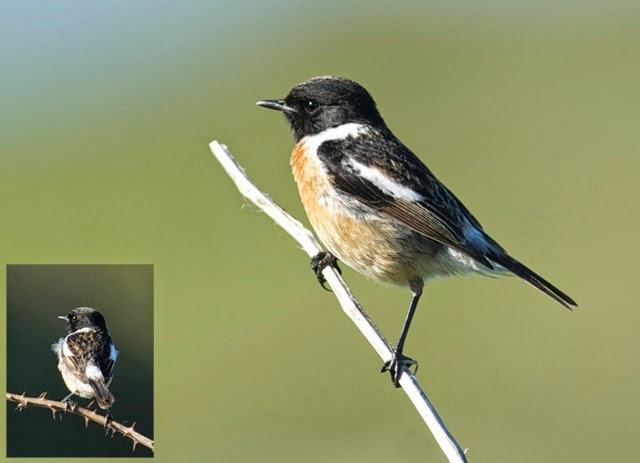 The best of the bunch was a Pied Flycatcher at Avalanche Road, where there were also 2 Spotted Flycatchers; the Bill area managed 4 Wheatears, 3 Spotted Flycatchers and singles of Grey Heron and Blackcap, whilst 5 Sanderling were at Ferrybridge. The island somehow contrived to get no more than a brief shower of rain out of some otherwise pretty unpleasant cool and windy conditions today. Most attention was given to the sea, with watches at the Bill coming up with c1000 Manx Shearwaters, 5 Common Scoter, 2 Great Skuas, a Great Northern Diver and a Sandwich Tern. 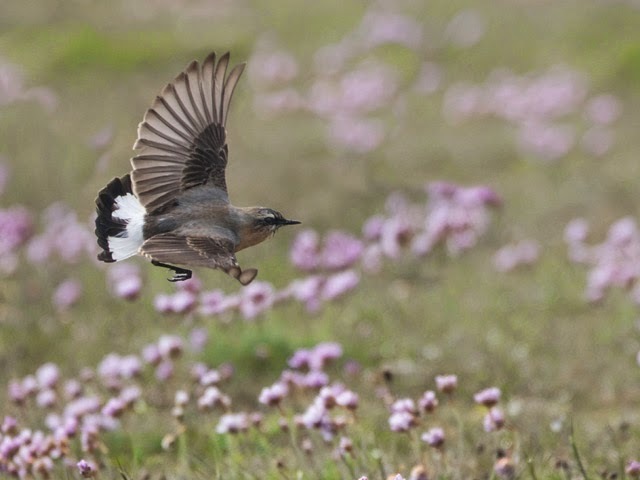 Whilst it was hardly passerine weather there were a few odds and ends of new arrivals in evidence at the Bill, including 2 Wheatears, a Whinchat and a Spotted Flycatcher. 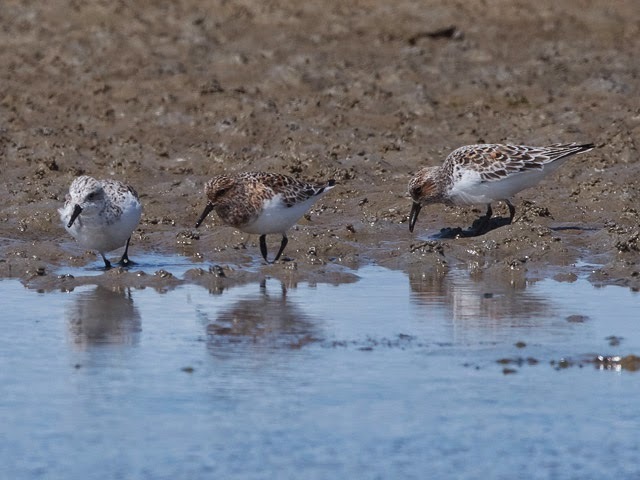 Waders at Ferrybridge included 9 Sanderling, 4 Dunlin and a Knot. The day's only reports were from the Bill where 4 Chiffchaffs, 2 Spotted Flycatchers and a Cuckoo made up the migrant tally on the ground and a couple of Sandwich Terns passed through on the sea. Immigrant interest in the moth traps has diminished to the extent that we'd forgotten to mention what little there'd been in the last couple of days; a Rusty-dot Pearl was the sole representative at the Obs last night. ...but this Dotterel was a surprise, even if it wasn't recognised at the time; in this case Nick had to call on the services of Magnus Robb for an ID. As the project keeps revealing, some of the fly-overs are quite wacky - what's this Sandwich Tern up to at 3 in the morning? 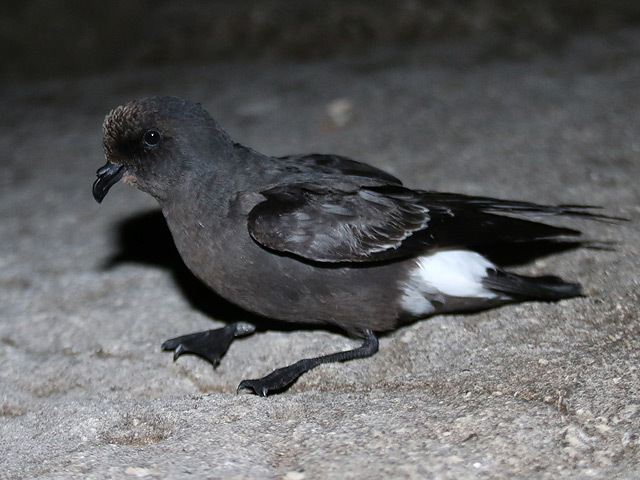 After a bit of overnight petrel action, when the first trapping session on the season saw 3 Storm Petrels tape-lured and ringed at the Bill, the day dawned beautifully clear and sunny - conditions that lasted through until evening when a freshening breeze and heavy cloud cover heralded the passage of a weak weather front. Probably not surprisingly given the conditions migrants were in short supply, with 3 each of Reed Warbler and Chiffchaff, 2 Spotted Flycatchers and a Sedge Warbler at the Bill and another Reed Warbler at Suckthumb; a continuing light trickle of Swifts, Swallows and House Martins were also still on the move overhead. Another day, another Bee-eater; today's bird over Top Fields at least went one better than the day before yesterday's individual and deigned to show itself to its finder, even if that was the limit of the viewing opportunities. 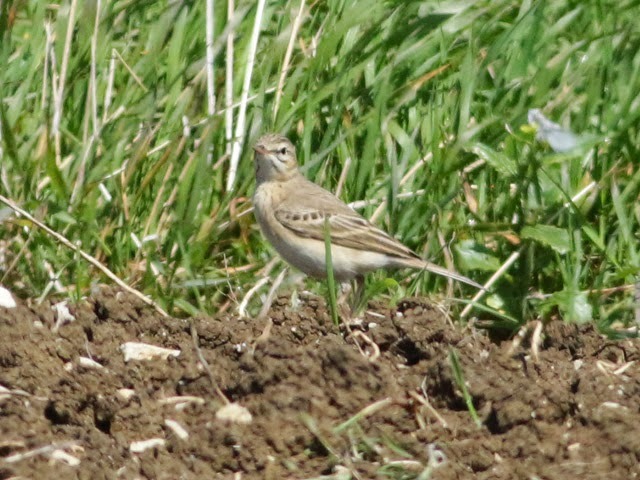 In what were again lovely conditions to be out birding there were a few other new arrivals in evidence at the Bill, including a trickle of Swifts and hirundines and a single Yellow Wagtail overhead, and 6 Chiffchaffs and 2 each of Wheatear, Willow Warbler and Spotted Flycatcher on the ground. 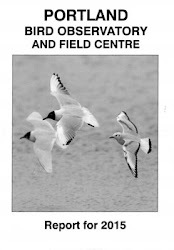 A reminder that the next In Focus field event at the Obs takes place between 10am and 4pm tomorrow, Tuesday 26th May 2015. Quality was hard to come by today, with only a small arrival of late migrants in what were really pleasant birding conditions. Chiffchaffs continued their rather unlikely dominance of the numbers, with the 10 around the Bill area looking to be nearly all new arrivals; the very thin back-up tally there and at Southwell included little more than 3 Spotted Flycatchers and singles of Black Redstart, Wheatear and Reed Warbler on the ground and a handful of Swifts and hirundines still arriving from the south. 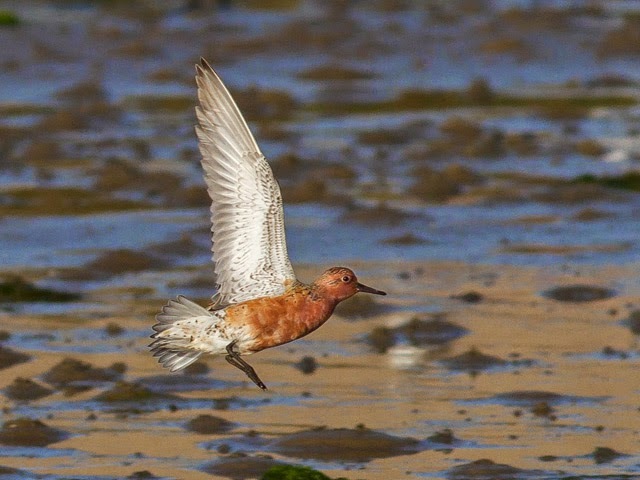 Elsewhere there were 9 Sanderlings amongst the waders at Ferrybridge. 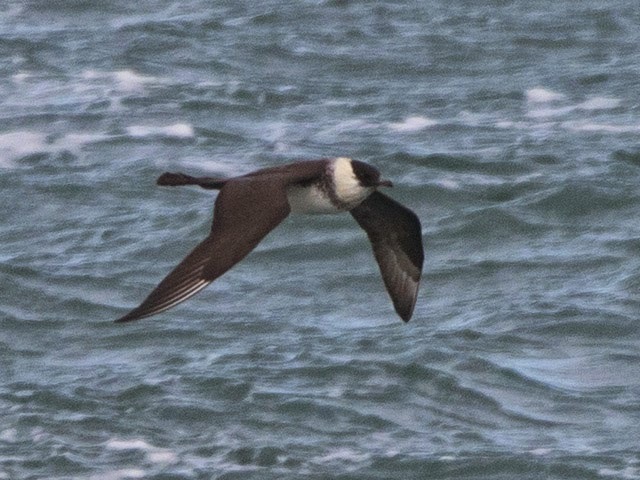 Singles of Great Northern Diver and Arctic Skua passed through off the Bill. 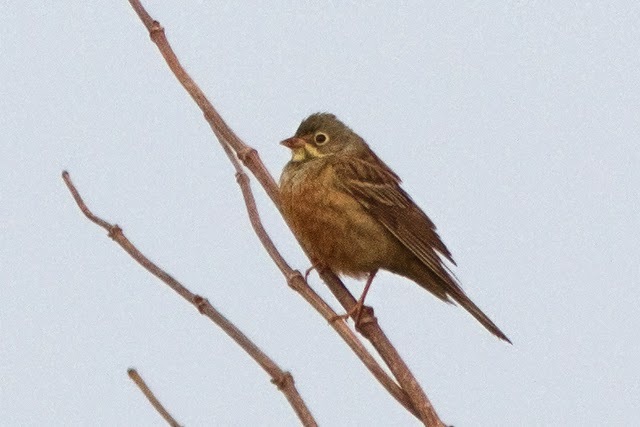 A couple more nice surprises today in the form of a Bee-eater heard overhead at Weston and an Ortolan Bunting that dropped in briefly at the Pulpit Bushes. Migrant numbers otherwise continued to dwindle, with just 2 Wheatears and 2 Chiffchaffs at the Bill, 21 Dunlin, 15 Sanderling, 10 Ringed Plover and a Greenshank at Ferrybridge and a light trickle of passing hirundines everywhere. 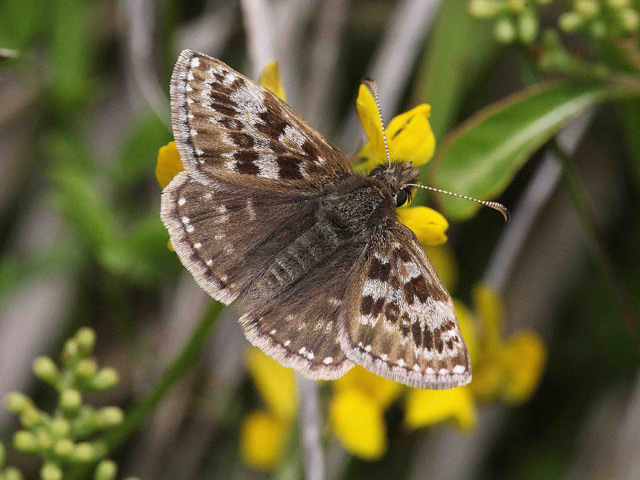 Despite less than promising conditions there was a conspicuous increase in immigrant moth numbers. 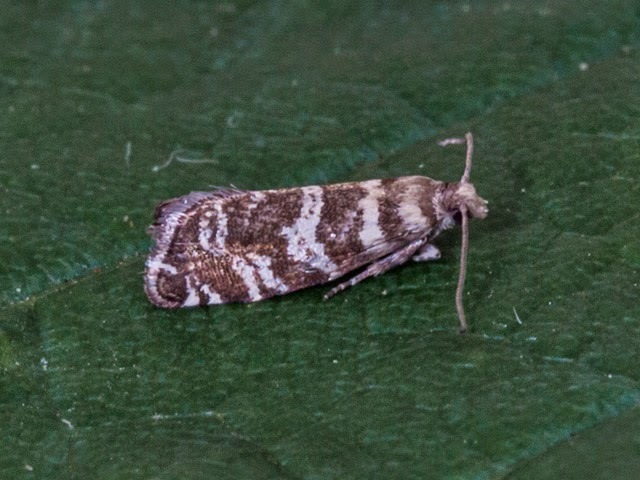 The night's highlight was a Common Spruce Bell Epinotia tedella at Sweethill - the first Portland record of this Norway Spruce and Sitka Spruce feeder; amongst the rest of the catches singles of Small Mottled Willow at the Obs, Bordered Straw and Orange Footman at Sweethill and Bordered Straw at the Grove were of particular note. 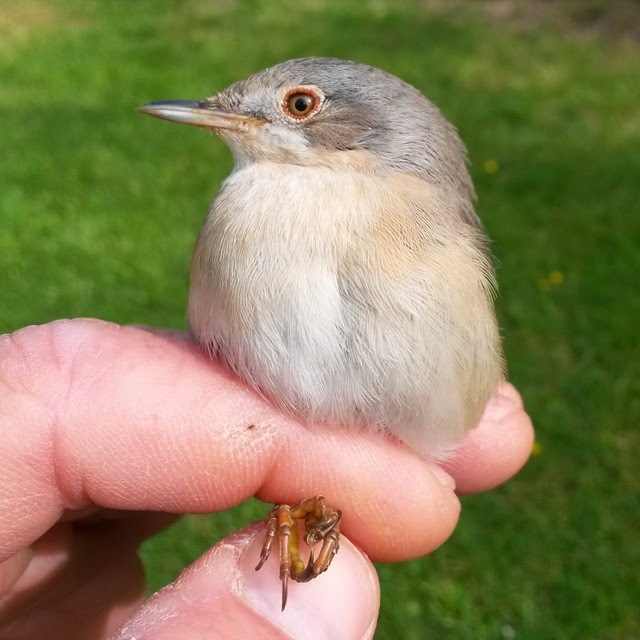 It's that time of year when surprises pop up quite out of the blue so on a lovely warm, sunny but otherwise largely migrant-lite day it maybe wasn't too unexpected when a Subalpine Warbler turned up during the morning in a mist-net in the Obs garden; sadly, it proved to be less than obliging after release when it afforded no more than a tantalising series of glimpses as it vacated the Obs Quarry. 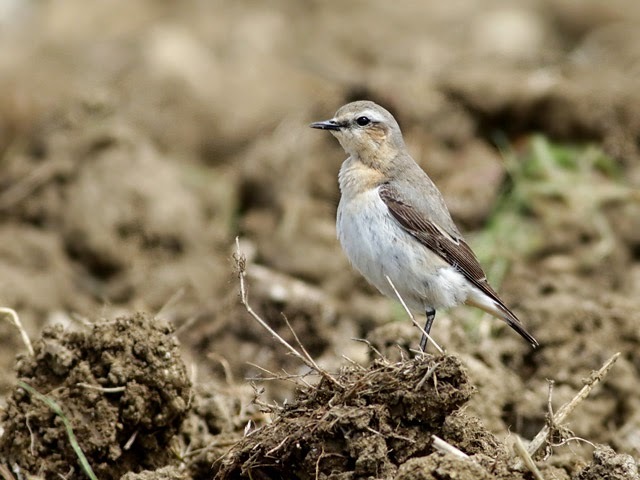 Earlier, singles of Cuckoo and Corn Bunting had been the pick of the thin scatter of arrivals at the Bill/Southwell that totalled 5 each of Chiffchaff and Spotted Flycatcher, and singles of Wheatear, Redstart, Sedge Warbler and Blackcap. 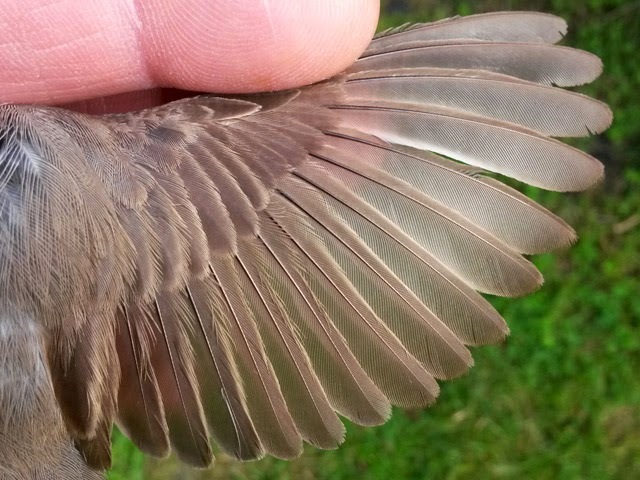 ...after all the various taxonomic changes, we've been slightly dreading catching a female Western-type Subalpine Warbler so today's bird was something of an education in seeing how far we could get with it (and, fortunately, one or two feathers were dislodged during handling so we do have those to fall back on!). Again, there was nothing in those calls to suggest Moltoni's but we're not sure whether that form is actually excluded by what was heard. 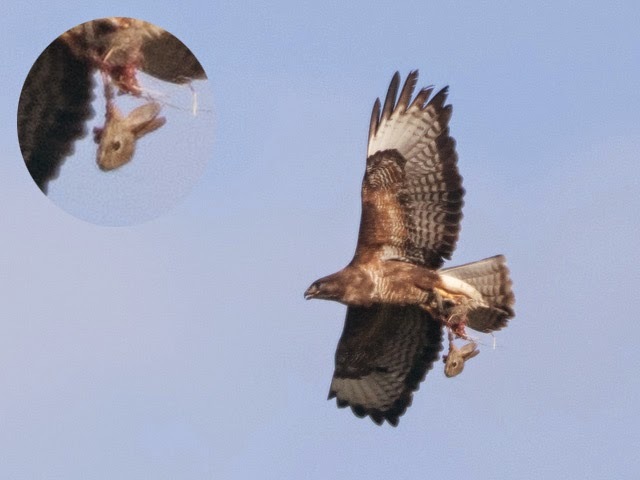 So, although it seems like Western is very much favoured on the available evidence we were still left short of 100% certain - hopefully the feathers will come up with a definitive answer. Grey skies and a spell of drizzly rain through the morning resulted in a nice little flurry of late migrants around the Bill area. Birding was hard going now that there's limited coverage and the trees are in full leaf, with the return from the Obs garden mist-nets suggesting that routine fieldwork was revealing a good deal less than was actually present, but numbers making the log included 33 Wheatears, 20 Chiffchaffs, 15 Spotted Flycatchers, 3 Reed Warblers, 2 Sedge Warblers and singles of Grey Wagtail, Robin, Redstart, Blackcap and Garden Warbler. Swallows were also still on the move, with sample counts indicating that getting on for 200 per hour were heading through along West Cliffs once the rain petered out. 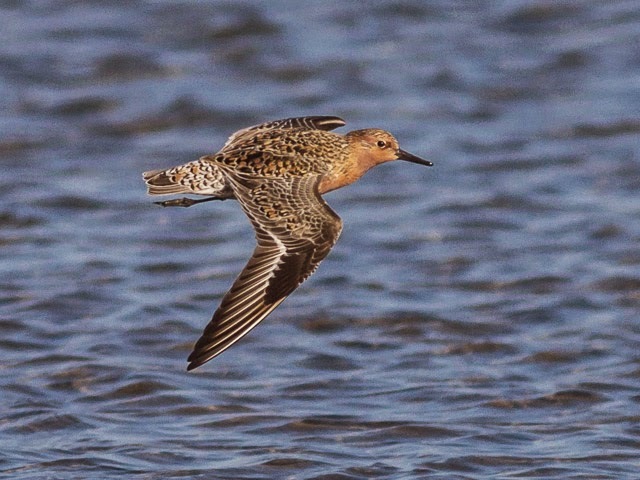 Seawatching came up with singles of Great Skua and Arctic Skua off the Bill and 9 Black-tailed Godwits and a Great Northern Diver through over Ferrybridge/Chesil. A further improvement in the conditions - albeit with the breeze still being in the north-west - saw a lot more movement today: variety picked up on the ground, whilst hirundines were arriving in good numbers for so late in the season. The day's highlights were a Serin that pitched into the Obs garden for no more than a few seconds and an Osprey that passed overhead at Ferrybridge, but the upturn in the overall migrant situation was almost as welcome. Hirundines provided the numbers, with a sample 90 minute count of 250 Swallows and 150 House Martins north along West Cliffs reflecting a strong passage that lasted well into the afternoon; small numbers of Swifts, a few late Sand Martins and a single Redshank also passed through overhead. 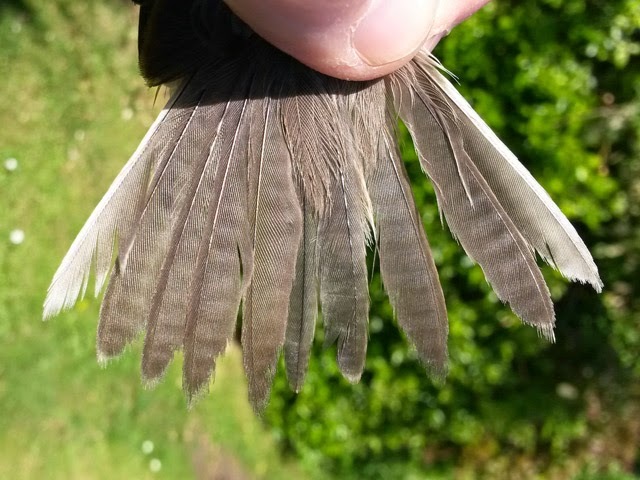 On the ground only the south of the island got much passerine coverage, but totals there included 6 Spotted Flycatchers, 2 each of Black Redstart, Reed Warbler, Willow Warbler and Chiffchaff, and singles of Redstart, Blackcap and Lesser Whitethroat. 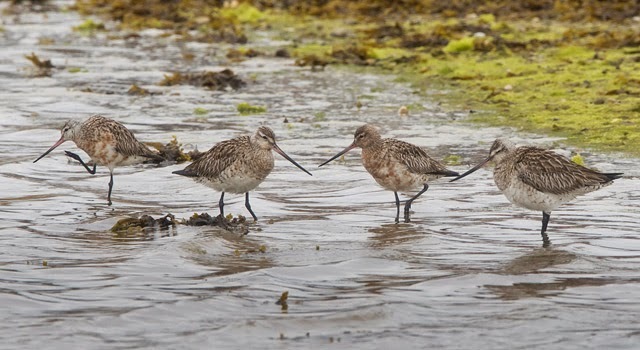 Waders at Ferrybridge included 16 Sanderling and 2 Whimbrel. A lone Bordered Straw at the Obs was the night's only immigrant moth. Slightly more to report but only by virtue of the unhelpful westerly wind having abated somewhat. 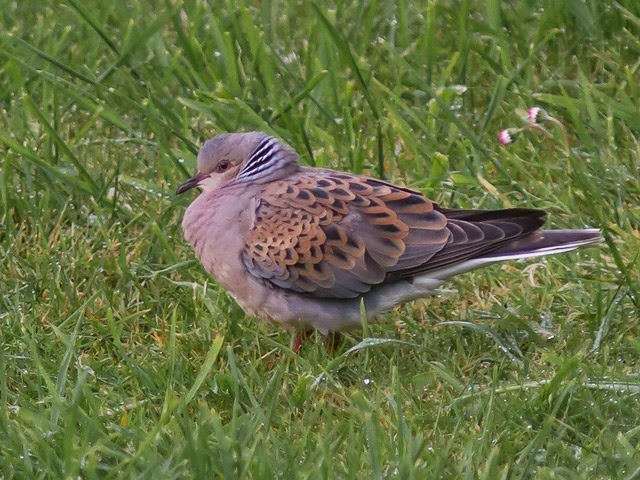 The Turtle Dove lingered on at Southwell and the majority of new arrivals were in the same area, with 5 Chiffchaffs, 3 Spotted Flycatchers and a Sedge Warbler scattered between Top Fields and Suckthumb Quarry; 2 Ringed Plovers were the only newcomers in the rest of the Bill area. 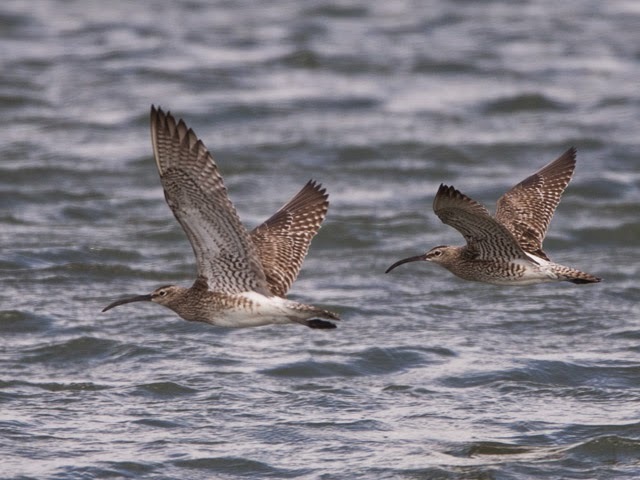 The 2 Whimbrel and single Wheatear also remained at Ferrybridge. The only seawatch reports were of singles of Great Northern Diver and Arctic Skua through off the Bill. Two more Bordered Straw were caught overnight in the Obs garden moth-traps. Only an eternal optimist would have expected much from a blasting and at times unpleasantly cold north-westerly so today's dismal showing hardly came out of the blue. 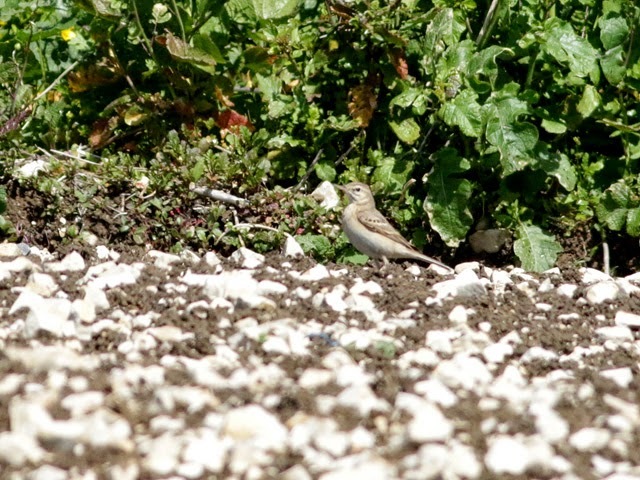 The migrant tally around the south of the island consisted of just singles of Wheatear and Spotted Flycatcher at the Bill and the lingering Turtle Dove at Southwell, whilst Ferrybridge came up with 72 Dunlin, 8 Sanderling, a Yellow Wagtail and a Wheatear. It felt rather like we'd slipped back into late winter today rather than continued the advance into early summer. 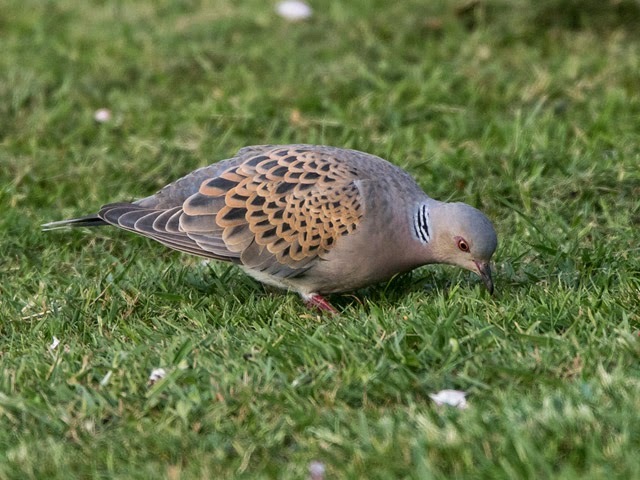 Migrants certainly weren't expected in a brisk north-westerly with drizzly rain always threatening through the morning, and a Spotted Flycatcher at the Obs and a Turtle Dove at Southwell looked to be just about the only new arrivals on the land. 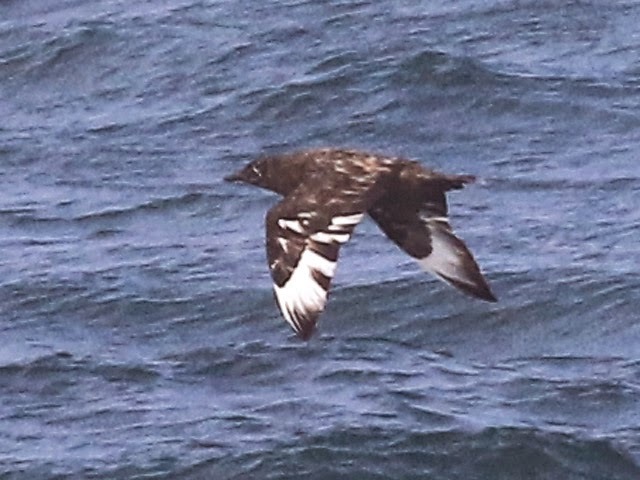 The seawatchers fared a little better, with 5 Great Skuas, 4 Arctic Skuas, 3 Ringed Plovers, 2 Great Northern Divers and a steady movement of Manx Shearwaters through off the Bill. 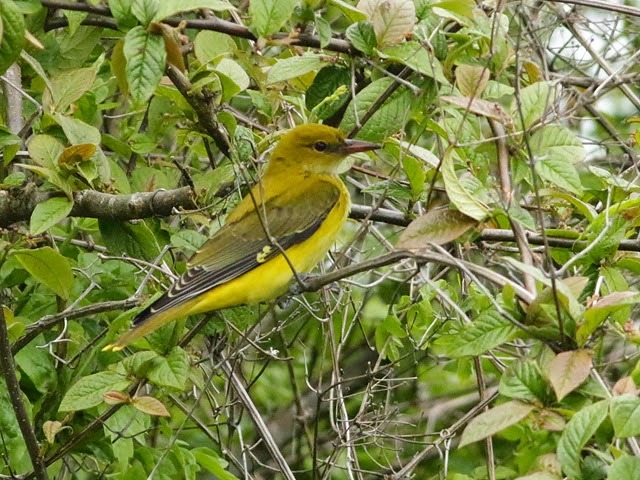 Clear skies and a north-westerly breeze didn't bode at all well for migrants and it was quite a surprise that variety was as good as it was, even if numbers were nothing special. A Nightingale was the best of the arrivals at the Bill, where 8 Spotted Flycatchers, 5 Chiffchaffs and ones/twos of Yellow Wagtail, Black Redstart, Wheatear, Whinchat, Sedge Warbler, Garden Warbler, Blackcap, Willow Warbler and Yellowhammer all made the tally; a similar array graced sites around the centre of the island, whilst 80 Dunlin, 10 Sanderling, 3 Knot, 2 Whimbrel and a Bar-tailed Godwit were at Ferrybridge. 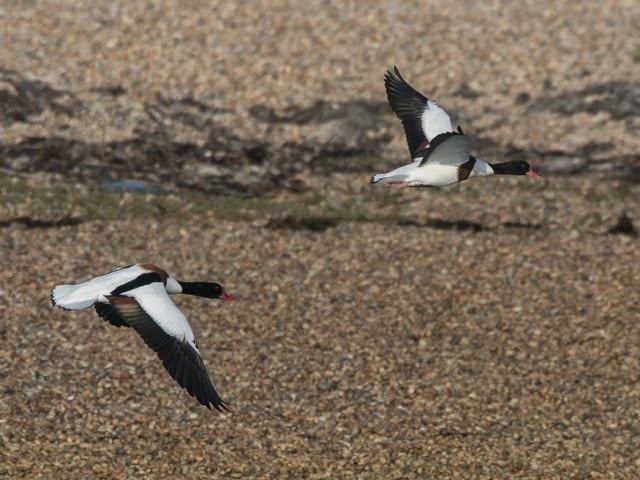 Two Shelduck and singles of Great Northern Diver, Little Egret and Pomarine Skua passed through off the Bill. 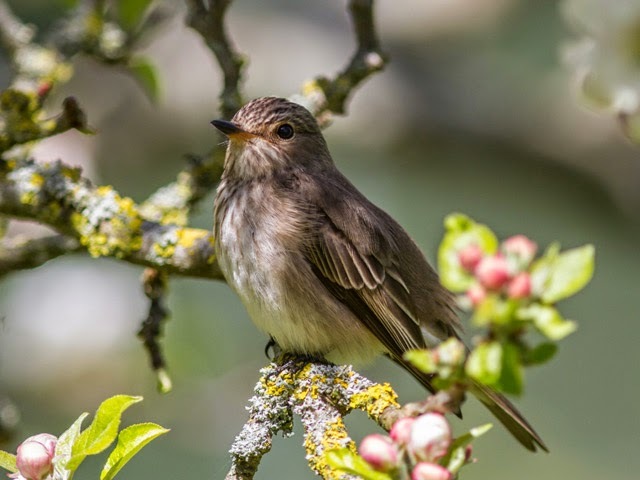 To our ears it seems like Thrush Nightingale just doesn't shut up - it churns away without ever really stopping - whereas Nightingale has distinct bursts of several seconds of song with similar length gaps of silence between each of these phrases. Thrush Nightingale also seems to blast off regular little staccato 'toy machine gun' rattles which we're not hearing in the Nightingale songs. We may well be being simplistic here - this certainly isn't a large sample and in each case the birds are patently stray migrants that mightn't be singing in an entirely typical fashion - but since there's a tendency to be awestruck rather than attentive to differences when encountering a singing migrant nightingale these pointers might be useful. Yesterday's north-easterlies were replaced by westerlies and interest dwindled right away. At the Bill numbers on the ground were reduced to just 4 each of Sedge Warbler and Spotted Flycatcher, and ones and twos of a handful of other expected routine migrants. 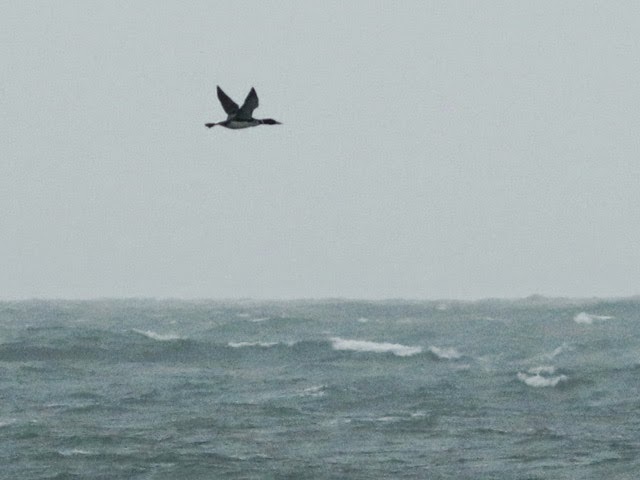 The sea was hardly any better, with 5 Shelduck, 3 Great Northern Divers and a single Arctic Skua the best off the Bill. Single Hummingbird Hawk-moths were again logged at several sites, whilst single Bordered Straws were caught overnight in moth-traps at the Obs and Sweethill. 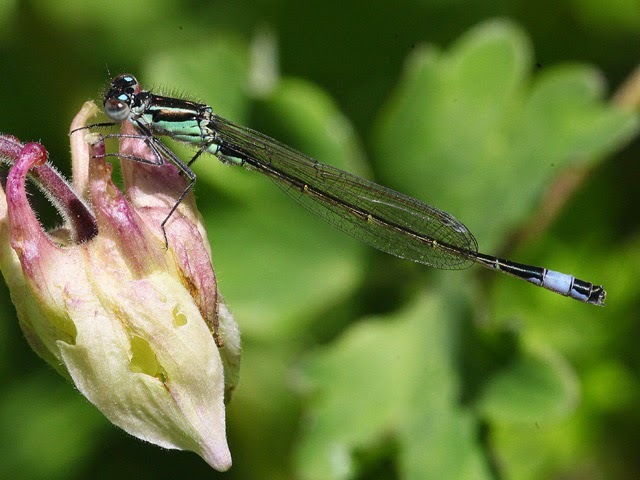 At long last a few migrants - not really that many and hardly scratching the surface when it comes to bolstering the seriously deficient May totals, but a lot more than have been in evidence just lately. 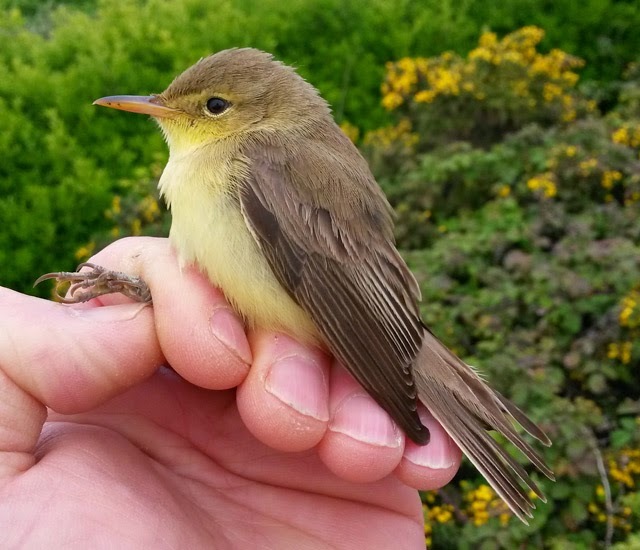 The day's highlight came in the form of a Melodious Warbler that was trapped and ringed early in the morning at the Obs and was still present late in the day when it was rediscovered at the Pulpit bushes, but after a comparatively barren couple of weeks the flurry of grounded migrants was almost as welcome. 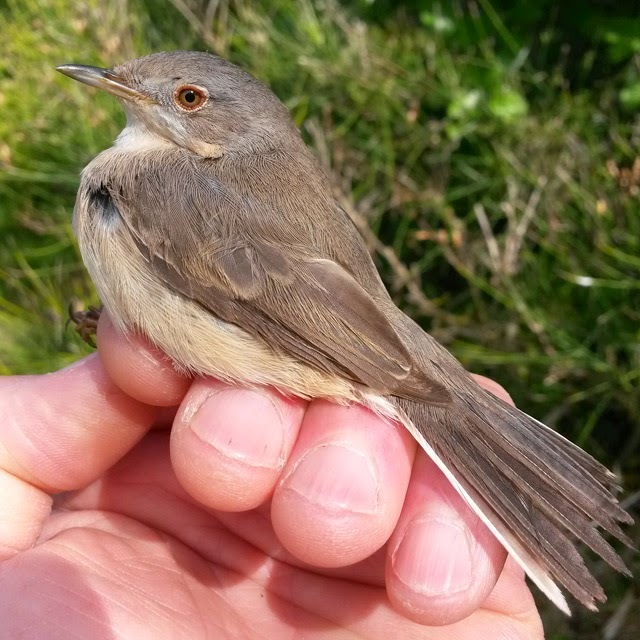 The Bill area returned totals of 20 Whitethroats, 12 Spotted Flycatchers, 10 Wheatears, 8 Redstarts, 6 Reed Warblers, 5 Chiffchaffs, 4 Whinchats, 3 each of Sedge Warbler and Blackcap, 2 Garden Warblers and singles of Grey Heron, Hobby, Cuckoo, Black Redstart and Willow Warbler, whilst a somewhat less of the same selection elsewhere included another Hobby and a Pied Flycatcher at Easton. 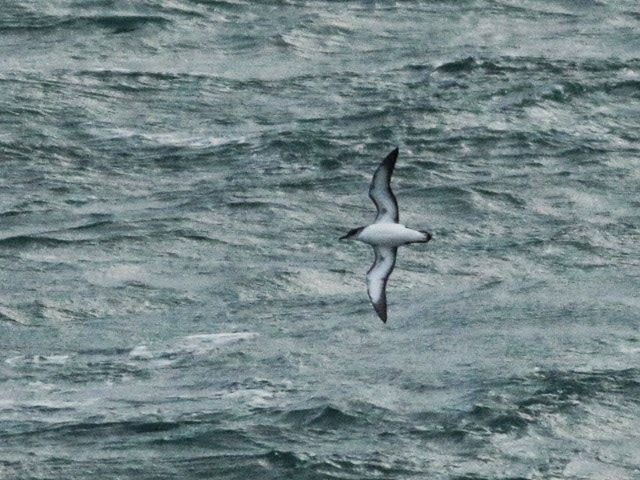 The sea came up with nothing much more than a handful of Manx Shearwaters, 5 Shelducks and a Great Northern Diver through off the Bill. Moth immigration picked up quite nicely with 2 Bordered Straw at Sweethill the highlight from overnight trapping; single Hummingbird Hawk-moths were at several sites during the day, when butterflies included several Painted Ladys and at least 1 Clouded Yellow at the Bill. 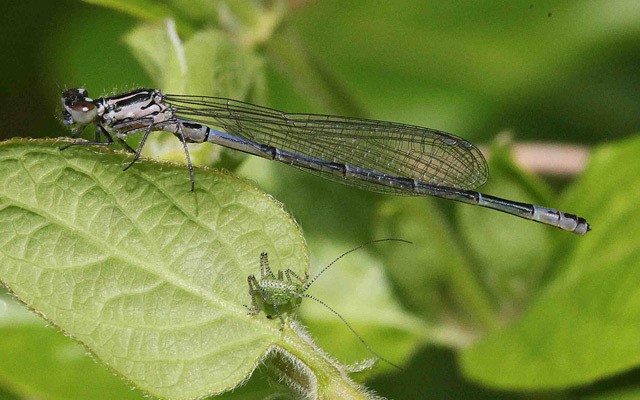 A reminder that the next In Focus field event at the Obs takes place between 10am and 4pm this Sunday, 17th May 2015. Yesterday's optimism that a stir-up in the weather might do the trick proved to be thoroughly misplaced, with the stiff south-easterly and heavy rain associated with a tight depression moving across the Western Approaches dropping few rewards in the common migrant line; 4 Chiffchaffs, 2 Spotted Flycatchers and singles of Ringed Plover, Wheatears, Whinchat, Sedge Warbler and Chaffinch at the Bill made up the tally at the Bill, whilst 50 Dunlin, 20 Sanderling, 4 Bar-tailed Godwits, 3 Whimbrel and 2 Knot were at Ferrybridge. The sea made every effort to save the day, with a surprisingly decent passage developing once the morning rain cleared through: 1000 Manx Shearwaters, 3 Arctic Skuas, 2 Balearic Shearwaters and a Red-throated Diver passed through off the Bill and another 2 Arctic Skuas passed Chesil. Singles of Hummingbird Hawk-moth and Painted Lady were at the Bill, whilst another Hummingbird Hawk-moth was at the Grove. One of these days things are going to pick up again - maybe tomorrow? - but there were precious few signs to give encouragement today. Amongst an otherwise paltry spread of migrants singles of Hobby, Cuckoo and Corn Bunting at the Bill, another Turtle Dove at Bumpers Lane and 120 Dunlin, 26 Sanderling, 5 Whimbrel and a Knot at Ferrybridge provided interest; also of note, the remains of a Golden Oriole - thought to have been killed by a Common Buzzard - were found in Top Fields. Seawatching came up with 100 Manx Shearwaters, 14 Sanderling and singles of Great Northern Diver and Arctic Skua through off the Bill. Singles of Painted Lady and Clouded Yellow were at the Bill today. The immigrant moth tally consisted of singles of Pearly Underwing at the Obs, Pearly Underwing and Silver Y at Sweethill, and Rush Veneer at the Grove. 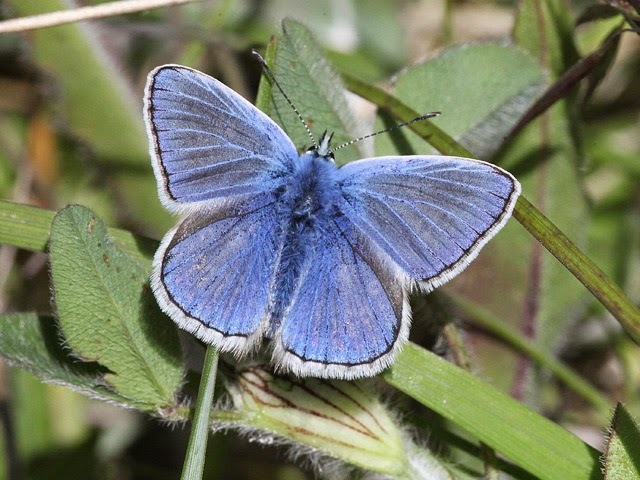 Only the faintest hint of an upturn in numbers on the ground today, with new arrivals limited to a thin spread of Spotted Flycatchers everywhere, 2 Chiffchaffs and singles of Cuckoo, Whinchat, Wheatear and Yellowhammer at the Bill, single Turtle Doves at Suckthumb and Bottomcombe, a Yellowhammer at Suckthumb (in view of extinction of the island resident population the latter perhaps most likely the same as the individual at the Bill) and 25 Sanderling and a Knot at Ferrybridge. It was a busier overhead, although incoming hirundines made up the vast majority of the numbers, a few Swifts and singles of Yellow Wagtail and a late Chaffinch added a little variety at the Bill. 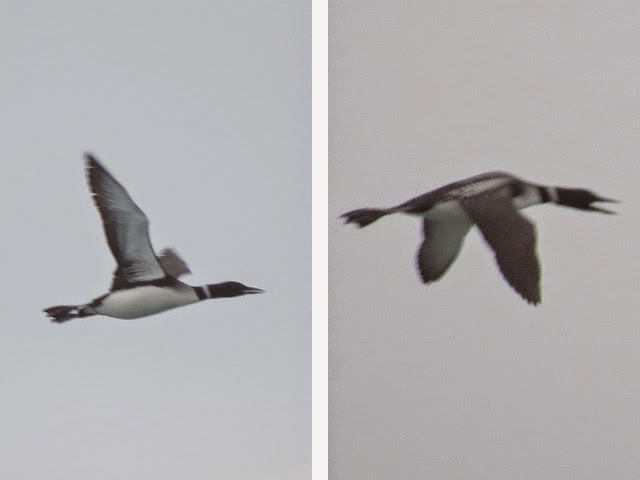 Seawatching at the Bill came up with 5 Great Northern Divers, 3 Shelduck and a Red-throated Diver. At Rusty-dot Pearl at the Obs was the night's only immigrant moth. 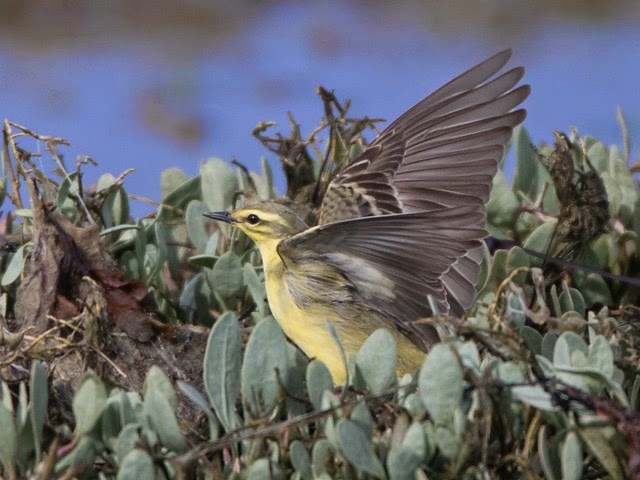 Another quite dreadful day for common migrants was salvaged for one fortunate observer when in quick succession he stumbled across 2 separate Golden Orioles at the Bill; sadly they didn't linger and there was only a passing Blue-headed Wagtail at Ferrybridge by way of other scarcity interest on the land. Routine migrants were sufficiently thin on the ground that it was possible to go for long walks without encountering a single one - a sorry state of affairs for this date. Seawatching was spoilt for the best part of the morning by lingering fog, but once that lifted 49 Common Scoter, 3 Great Northern Divers, 2 Arctic Skuas, a Great Skua and a Pomarine Skua were logged at the Bill. 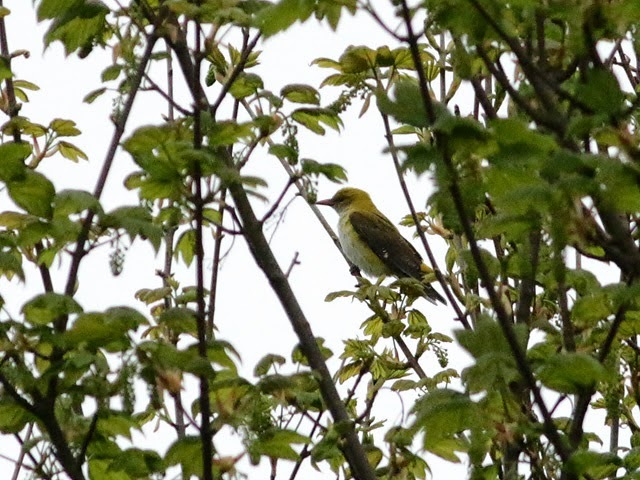 It was certainly quality rather than quantity that made the day today, with the Tawny Pipit again showing from time to time at the Bill and a real surprise in the form of a Portland record total of 4 Golden Orioles that showed up behind the Easton Fire Station before becoming extremely mobile and ranging off as far as Wakeham. Common migrant remained stubbornly uncommon for the most part: although variety increased, numbers were far from impressive, with nothing except Chiffchaff managing a double figure total on the ground at the Bill; the best of the oddities were singles of Cuckoo, Turtle Dove and Ring Ouzel at the Bill, at least 1 more Turtle Dove at Southwell, a Hobby over Blacknor and 2 each of Canada Goose and Curlew Sandpiper at Ferrybridge. 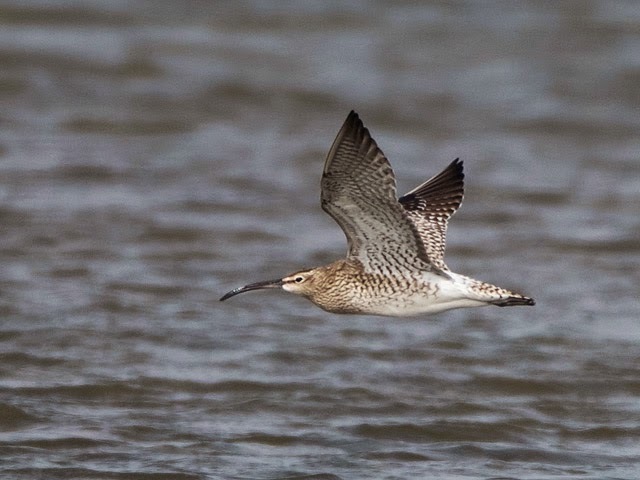 The sea got plenty more attention, with a total of 11 passing Great Northern Divers of particular note at the Bill where, in the continuing absence of the expected terns, 3 Pomarine Skuas, 2 Arctic Skuas and a Black-throated Diver made up the bulk of the rest of the day's tally. 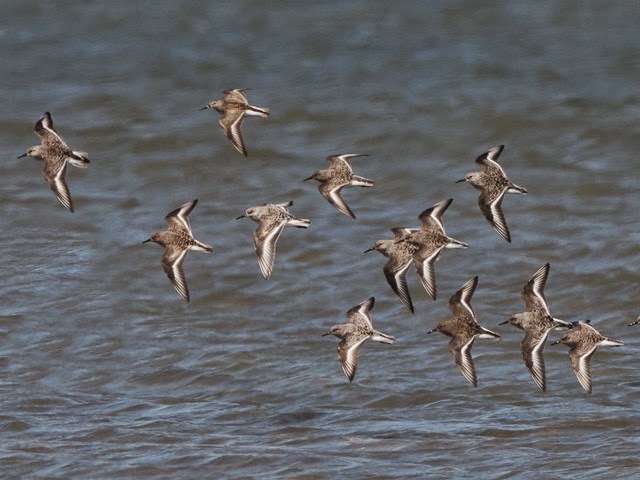 Although routine migrants remained almost startlingly few and far between today did come up with plenty of interest: another pulse of Pomarine Skuas entertained on the sea, whilst a Tawny Pipit that showed up in the Crown Estate Field was a very welcome oddity - in fact now so infrequent, not only at Portland but also nationally, that it's evidently recently been re-admitted to the list of 'official' UK rarities. 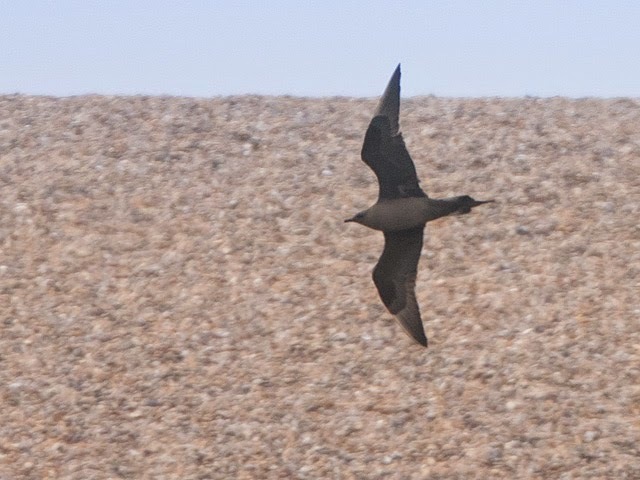 For some, the Pomarine Skuas were as frustrating as they were entertaining, with one party of 10 that shuttled back and forth between Chesil Cove and the Bill before finally departing up-Channel eluding plenty of observers who were chasing after them between the two sites; the final tally was uncertain but it appears that at least another 2 birds were logged at the Cove. Further seabirds included at least 7 Great Skuas, 4 Arctic Skuas and 2 Great Northern Divers through off the two watchpoints. 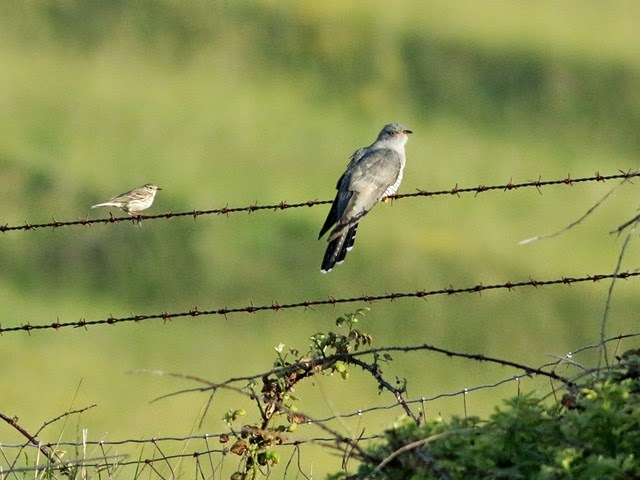 Apart from the Tawny Pipit the land was very disappointing; a Turtle Dove did pitch up at Southwell, but there was little else on the ground bar a handful of Wheatears, Chiffchaffs and Spotted Flycatchers everywhere and singles of Lesser Whitethroat and Whinchat at the Bill. A day not without its highlights - notably a likely Bonaparte's Gull off Chesil early in the morning - but ultimately considerably less interesting than both the forecast and the prevailing conditions might have suggested. The mix of a waft of south-easterly together with cloud and occasional spits and spots of rain, had looked promising for a fall of migrants, but although Swallows in particular were passing through in sometimes spectacular numbers (not far shy of 5000 per hour at times) from quite soon after dawn there were modest numbers at best on the ground. 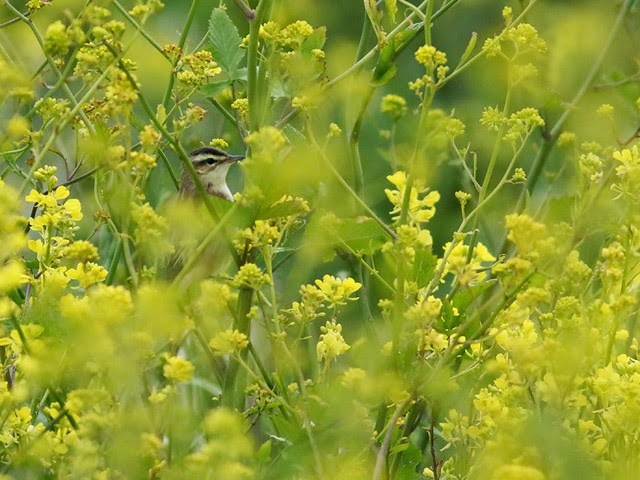 Although neither has been at all numerous for some while, Chiffchaff overtook Willow Warbler to get up to 20 at the Bill, where a similar total of Wheatears represented the only other double figure total; a noticeable improvement in variety everywhere included a Corn Bunting at Barleycrates Lane, a Firecrest at the Craft Centre and singles of Little Ringed Plover and Black Redstart at Ferrybridge. Visible passage was less varied but did come up with singles of Merlin at the Bill and Hen Harrier and Hobby over/off Chesil. Over the sea the continuing paucity of terns was perhaps the most notable event; highlights amongst the tally of things that did show up included 81 Whimbrel, 2 Great Northern Divers, 6 Pomarine Skuas, a Greenshank and an Arctic Skua off Chesil and 5 Great Northern Divers and 2 each of Pomarine Skua and Arctic Skua off the Bill. 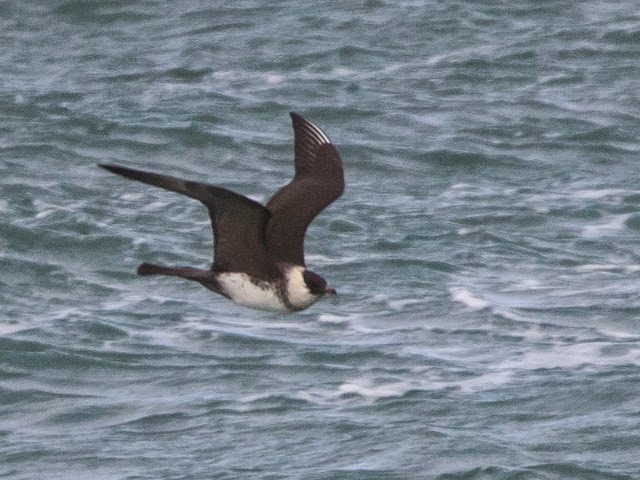 In much improved conditions it was no surprise that Pomarine Skuas should feature again, with all those that had no doubt been holed-up riding out the storm in Lyme Bay striking out up-Channel with the sun on their backs; it was certainly a short, sharp passage at the Bill, where 28 passed though in little more than an hour, accompanied only by one solitary Arctic Skua. Towards evening another 10 Pomarine Skuas had gathered off Chesil, and were the only other skuas recorded all day. Seawatching was otherwise remarkably unrewarding, with 3 each of Red-throated Diver and Great Northern Diver through off the Bill, 3 more Great Northern Divers through over Chesil and a Little Gull lingering off the beach. The quieter conditions overnight likely favoured passerine migration, but it remained much too clear to have expected any sort of fall; Spotted Flycatchers got well into double figures around the south of the island, but the very thin spread of other arrivals included nothing much better than a Grasshopper Warbler at Southwell. 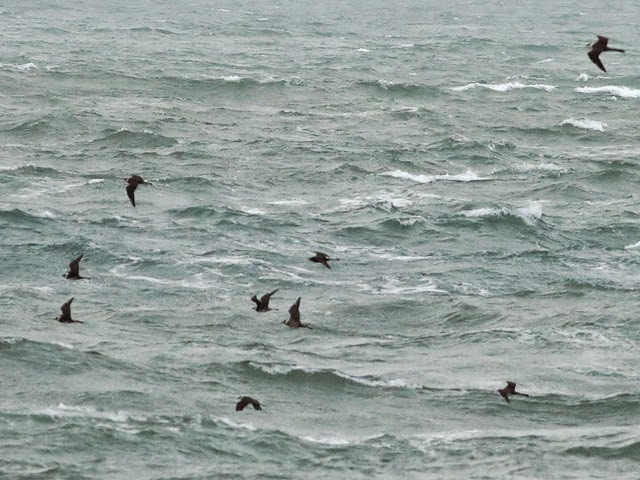 A second day of wild weather and skuas. Seawatching again dominated proceedings, with the two main watchpoints coming up with 13 Pomarine Skuas, 4 Arctic Skuas, 4 Arctic Terns, 3 Great Northern Divers and a Great Skua off/over Chesil/Ferrybridge and 5 Great Skuas, 5 Arctic Skuas, 4 Great Northern Divers, 4 Pomarine Skuas, a Red-throated Diver and a Black-throated Diver off the Bill. What little birding was possible on the land came up with next to nothing of significance: there looked to be no more than a handful of grounded migrants anywhere, whilst a passing Hobby at the Bill was the pick of the visible passage that otherwise consisted mainly of Swallows trickling in off the sea. 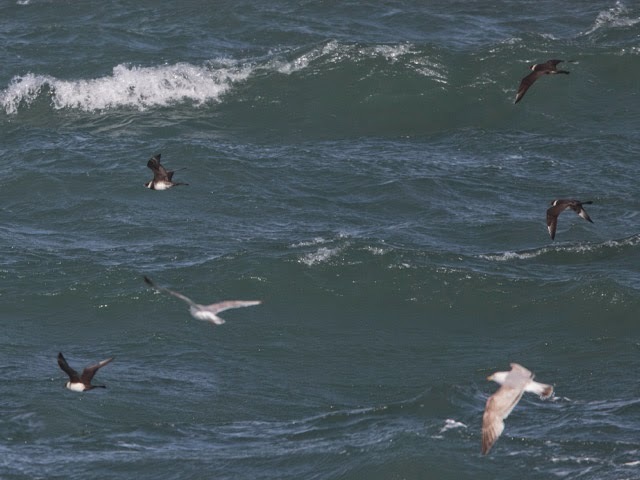 Such is the high value to which skuas, and particularly Pomarine Skuas, have been elevated that the forecast of an unseasonable gale had brought forth a state of euphoric anticipation on the part of certain seawatchers, even if rarity- and migrant-seekers were noticeably less enthusiastic. With strong winds already well-established by dawn the highest value skua - a Long-tailed - managed to sneak through both Chesil Cove and the Bill before many watchers were even on station, but thereafter totals of 10 Great Skuas, 6 Pomarine Skuas and an Arctic Skua off Chesil Cove and 7 Great Skuas, 5 Pomarine Skuas and 3 Arctic Skuas off the Bill seemed to satisfy the gathered throng; seawatching was otherwise rather unrewarding: 2 Storm Petrels at Chesil Cove (one of which ended being blown into Portland Harbour) were a first for the year, plenty of Manx Shearwaters were off both watchpoints, but there was little more than 3 Great Northern Divers and singles of Red-throated Diver and Black-throated Diver off the Bill by way of additional quality. Although it was hard to believe many migrants had been on the move during a constantly wet and increasingly windy night there were a few new arrivals about at dawn, with a second Ring Ouzel joining the lingering individual at Coombefield and a handful of Spotted Flycatchers, Garden Warblers, Blackcaps and phylloscs in evidence in sheltered spots around the south of the island; diurnal migrants were much more conspicuous, with a steady stream of hirundines and a few Swifts arriving in off the sea once the early rain had cleared through. Roller coaster migration conditions at the moment: one moment utterly unsuitable and the next so good that nothing drops in; were it not for the fact that Swallows were making up for lost time and streaming through (at a rate of 1200 per hour at times) the fieldworkers trudging around relatively empty bushes would have been forgiven for believing that nocturnal migrants hadn't been on the move, which we're sure they must have been under a full moon and with conditions much improved over the Continent. The grounded tally was really pretty pitiful, with just 4 summer migrants ringed all day at the Obs and no more than odd ones and twos of a few expected species everywhere else; minor highlights included a Ring Ouzel at Coombefield, a Grasshopper Warbler at Suckthumb and 2 Bullfinches, a White Wagtail and a Pied Flycatcher at the Bill. Prizes from the sea were still hard to come by, with an awful lot of watching eventually coming up with precious little more than 4 Great Skuas, 2 Pomarines Skuas and an Arctic Skua off the Bill and 2 Arctic Skuas and a Great Skua off Chesil. ...it's usually assumed on distant seawatch views when detail can't be made out properly that scratchy-looking plumage like this is the result of pale feather bases being exposed due to moult; however, in this case it's pretty obvious that there are all sorts of white bits where there shouldn't be and that this is a leucistic individual. 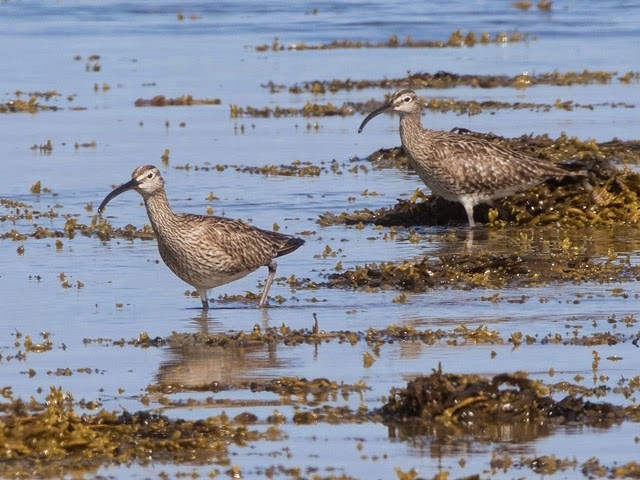 Once early rain had cleared through it was apparent that at least a few new migrants had managed to get through, with considerably more about than for several days; the sea also had its moments in an at times blustery south-westerly although fog was a frequent problem through the morning. Phylloscs have been steadily replaced by larger warblers when there have been drops on migrants in the last week and that trend continued today, with the Obs garden mist-nets returning totals of 9 phylloscs (8 of which were Willow Warblers), as against 29 other warblers (including 12 Garden Warblers); in the stiff wind birding on the land wasn't easy and there were no reports of anything particularly out of the ordinary amongst the light spread of arrivals everywhere, although 3 Purple Sandpipers at the Bill were the first there for more than a month and were likely pausing migrants. The list from the seawatchers had a more respectable look than of late, with 8 Great Skuas and 4 each of Arctic and Pomarine Skua through off the Bill and 5 Great Skuas and a Pomarine Skua off Chesil; back-ups weren't at all plentiful, with nothing in numbers off the Bill bar 200 or more Manx Shearwaters, 80 commic terns and a steady although not fully quantified passage of Kittiwakes (the first real numbers of the latter so far this spring).